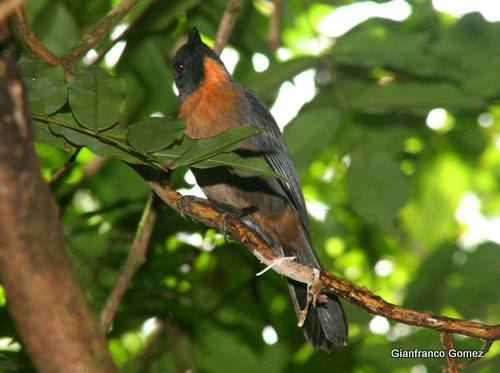 Of the over 850 bird species listed in Costa Rica, 3 are mainland endemics. In other words they are unique to Costa Rica not found anywhere else in the world. Two of the three species are endangered and one of them is restricted solely to the Osa Peninsula. That restricted endangered species is the Black-cheeked Ant-Tanager (Habia atrimaxillaris). Logging and habitat loss outside of protected areas appears to be its main threat with its range being halved since 1960 according to BirdLife International. The male is distinguished from the female by his blackish body and salmon colored throat and crown. Like many tanager females, she is the duller (in color) more yellowy version of him. They are restricted to dense foliage along edges and streams in lowland forest. They travel in pairs, family groups or in mixed flocks of ant-wrens, greenlets and foliage-gleaners rummaging through dead leaves looking for insects and will often forage at army ant swarms. They are also known to eat berries from time to time. Though it has lost much of its habitat it remains common in its strongholds of Corcovado and other intact areas of the peninsula. When you come across them they are hard to miss as they are raucous and give lots of scolding notes to one another. During the height of the breeding season I can hear them chatting it up right outside my window here at the Osa Biodiversity Center at Friends of the Osa. Friends of the Osa, Liz Jones and Abraham Gallo of Bosque del Rio Tigre Lodge and the American Bird Conservancy have worked tirelessly to establish the species current distribution so keep your eye out on our web pages for upcoming publications and reports on this species and others of concern in this area. Oh and the other two mainland endemic species of Costa Rica: The Mangrove Hummingbird, also considered endangered, is restricted to Pacific coast mangroves which are disappearing fast, and the Coppery-headed Emerald which is fairing a bit better in its north-central range. There are 3 other bird species endemic to Costa Rica and they are found on the Isla de Coco, about 532 km off the Pacific coast, and they are: Cocos Cuckoo, Cocos Flycatcher and Cocos Finch. We would like to thank Gianfranco Gomez from the Drake Bay Rainforest Chalet for their stunning photographs and allowing us to showcase them. You can find them just up the Pacific coast from us in Drake Bay, Costa Rica. This entry was posted in Birds and tagged Conservation, Costa Rica, Osa Biodiversity Center, Osa Peninsula, Tropical Birds. Bookmark the permalink.